As the Chinese New Year is celebrated and the ‘Year of the Horse’ gets underway I had the opportunity to launch a few lanterns myself, albeit from a beach in Thailand. Being an aviation buff I have a sense of excitement for all things that ‘go airborne’ in one fashion or another and…. these lanterns are no different. Having celebrated Chinese New Year before in China the launching of thousands of lanterns is quit a spectacle along with the massive amounts of other pyrotechnics that are lunched. In touristy parts of Thailand the same type of lanterns are launched nightly by tourists who purchase them along the beaches. 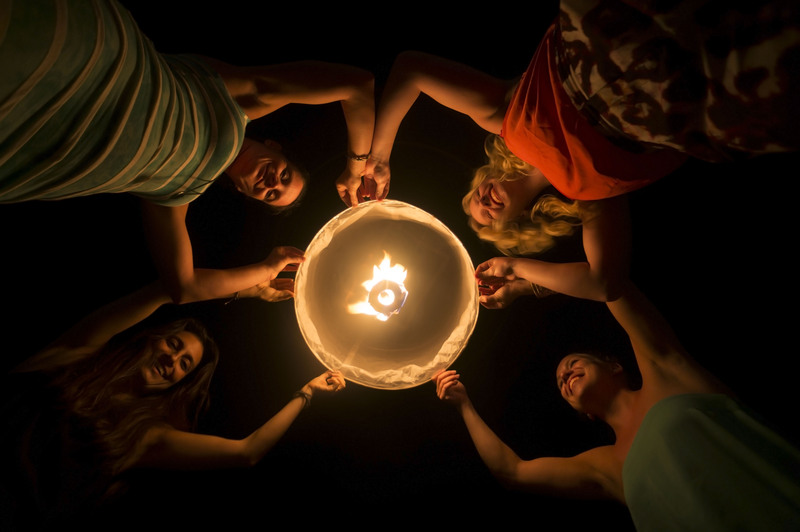 This night portrait with ambient light only from the lantern was taken of four girls who met each other for the first time to attend a yoga retreat on the island of Koh Samui.